Previously sold in our London Rooms, 14 July 1982, lot 196. Cf. similar examples including one in the Exhibition of Blue and White Wares, Shanghai Museum, Catalogue no. 24; a dish formerly in the Gustav VI Adolf Collection, and now in the Museum of Far Eastern Antiquities, Stockholm, illustrated in Oriental Ceramics, Kodansha series, vol. 9, Tokyo, 1976, pl. 216; an example in the Percival David Foundation, London, illustrated in Oriental Ceramics, Kodansha series, vol. 6, Tokyo, 1982, pl. 74; one from the T. Y. Chao and R. E. R. Luff collections exhibited at the Hong Kong Museum of Art, Ming and Ching Porcelain in the Collection of the T.Y. Chao Family Foundation, illustrated in the Catalogue, 1978, no. 3; another illustrated in Selected Masterpieces from the Manno Collection, Japan, 1988, pl. 109; and several examples in Middle Eastern collections including one illustrated by T. Misugi, Chinese Porcelain Collections in the Near East, Topkapi and Ardebil, vol. 3, Hong Kong, 1981, pl. A.41; another from the Topkapi Museum, Istanbul, illustrated by Regina Krahl, Chinese Ceramics in the Topkapi Saray Museum, vol. 2, London, 1986, no. 606; and five examples in the Ardebil Shrine Collection, one of which is illustrated by John Alexander Pope, Chinese Ceramics from the Ardebil Shrine, Washington, 1956, pl. 38 29.52. A number of related bracket-lobed examples have also been recorded including one illustrated by Jessica Harrison-Hall, Ming Ceramics in the British Museum, London, 2001, pl. 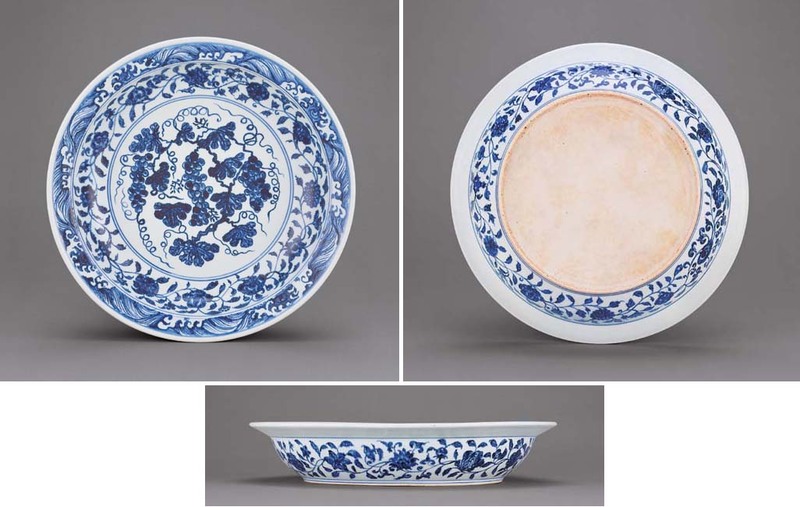 3:36, where the author mentions that this grape dish pattern became the most influential design model for Iznik potters making blue and white wares in the 1530s and 1540s; one published in Chinese Ceramics in the Idemitsu Collection, Japan, 1987, no. 165; and another in the Museum Pusat, Jakarta, illustrated in Oriental Ceramics, Kodansha series, vol. 3, Tokyo, 1982, col. pl. 27.